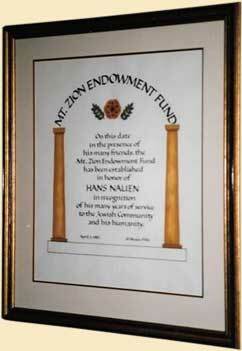 The Mount Zion Endowment Fund, established on April 3, 1982, 10 Nissan, 5742, shall be formally known as the Hans Nauen Endowment Fund. The fund honors Hans Nauen for his many years of service to the Jewish community and for his humanity. Endowment - The endowment is an established fund of cash, securities, or other assets set aside for perpetuity in order to provide for the long-term financial well-being of Mt Zion Temple. The purpose of the Endowment Fund will be to create a critical mass of funds whose income can be used to secure Rabbinical services to the community as well as support Jewish Congregational life. Mt. Zion Temple accepts gifts of any amount to the fund. At least 80% of the Endowment Funds will be invested in government guaranteed certificates of deposit. Any changes from this policy require Board and Congregational approval. In any year, the Board of Directors may, at its discretion, order the withdrawal of up to 4% of the Endowment Fund total, an amount intended to roughly estimate the interest earned in any particular year. Like all elements of the budget, this action requires the Congregation’s approval. More than 4% of the Endowment Fund may be expended only in the case of financial emergency (I.e. when the financial viability of Mount Zion Temple is at stake). Such an action requires the approval of the Board and a 2/3 majority of those attending an appropriately called Temple meeting. In the event of the dissolution of the Temple, the Endowment Fund will be allocated among Jewish charities as determined by the Board of Directors and approved by the Congregation. To the extent that there is perceived to be a conflict between this Endowment Fund policy and the Temple by-laws, this policy will be interpreted as duly enacted amendments to the Temple by-laws. On this date in the presence of his many friends, the Mt. Zion Endowment Fund has been established in honor of Hans Nauen in recognition of his many years of service to the Jewish Community and his humanity.